Close clearance dryer vent periscope pipes are the only way to reduce the space behind the dryer from 4.5" to 2.5". Use them to position the dryer closer to a wall. Both the 29"- 50" and 18"-29" periscope pipe can be installed with the outlet end either facing the dryer or turned away from the dryer. 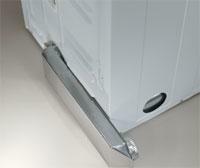 Use the 0"-18" when the dryer exhaust and wall exhaust are close but do not exactly line up. Periscope Pipes are 6" wide X 2" deep.